Do you know your photo contains a lot of information including photo taken GPS location, camera maker, camera model, photo size? This software can help to view all EXIF (Exchangeable image file format) information in your photos. It can also navigate you directly to google map to see where the photo was taken. 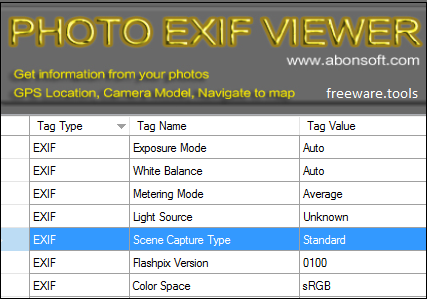 Abonsoft Photo EXIF Viewer can show you the EXIF metadata from an image file. EXIF information can include data on when a picture is taken, where it was taken (GPS coordinates), what device took the photo and so on. This tool will display that data if it is available. When taking a picture with a digital camera, the device captures a wide range of information and associates it with the image thus creating the so-called EXIF data. These details require a specialized application to be accessed, and Abonsoft Photo EXIF Viewer is one such solution. The utility comes with a user-friendly interface that makes it easy even for beginners to make the most of its features. You need to start by selecting the image whose EXIF you want to have a look at, no matter if it is JPEG, JPG or TIFF. This can be done by either dragging and dropping the file onto the main window or by manually browsing to its location. Support for RAW formats would be truly appreciated by those who do not want to convert the images on their digital cameras to JPEG before reading their EXIF. Once the source graphic file has been loaded, the available EXIF data is instantly displayed, showing the file name and size, the camera manufacturer and model or the dimensions. You can also examine the exposure time, the digital zoom ratio, the aperture value or the ISO speed ratings while also getting access to the date when the original file was captured. All EXIF data can then be exported to CSV or TXT files that can be saved for later use or analysis. If your camera can assign GPS coordinates to your image, then Abonsoft Photo EXIF Viewer can show the longitude and latitude of the place where you took the photo. It can even open Google Maps in a dedicated window to help you identify the exact location. To wrap it up, Abonsoft Photo EXIF Viewer is a nifty software solution for those who want a hassle-free app for analyzing and exporting EXIF data.